The trustees of Mount Auburn first started to consider establishing a crematorium in 1885 but awaited “the further development of public sentiment.” In 1897 the Cemetery applied to the state legislature for an act authorizing Mount Auburn Cemetery to establish a crematory. Architect Willard T. Sears was enlisted to design a plan to renovate the interior of the old chapel (now Bigelow Chapel) to accommodate a crematory, and “only the outer granite structure which it was deemed desirable to retain on account of its associations was preserved. In 1899, the interior of the old chapel was renovated to accommodate the first crematory in a cemetery in Massachusetts. (The first cremation in Massachusetts – that of the well-known suffragist and social reformer, Lucy Blackwell Stone – took place in December of 1893 at a facility operated by the Massachusetts Cremation Society.) A basement was constructed and the floor was raised. Additionally, an elevator in front of the alter area was installed for lowering caskets to the retorts below. *In 2017, the U.S. cremation rate was 51.6%. By comparison, the 2017 cremation rate in Canada was 70.5%. *By 2030, the U.S. cremation rate is predicted to reach 70%. *At 47.1%, Massachusetts’ annual rate of cremation is the lowest of all New England states. By comparison, the 2017 rates in the rest of the region were as follows: Maine – 75.9%; New Hampshire – 73.8%; Vermont – 70.6%; Connecticut – 55.4%, and Rhode Island – 8%. *Though it currently has the lowest cremation rate in the New England region, Massachusetts is in a period of rapid growth and its annual cremation rate is expected to grow dramatically in the next decade. 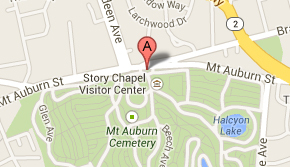 *Mount Auburn’s crematory is one of 24 in the state. By state law, only cemeteries may own and operate crematories in the Commonwealth of Massachusetts. Mount Auburn offers many options for the burial of cremated remains. Hazel Path, currently under construction, will provide cremation burial space for approximately 400 individuals along a beautiful woodland path offering a spectacular view of the Boston skyline. Statistics extracted from the Cremation Association of North America’s Annual Statistics Report (2018). This interesting article does not provide cremation methods in 1900 compared to today’s methods. That would have been interesting to read.